John Travolta says this in the 1996 movie “Phenomenon” when he realizes he has a very short time to live but is not afraid of what the future will bring. This got me thinking about some of the amazing changes I have seen in my very short time on this planet. I was watching the 1988 movie “Big” with Tom Hanks. At one point, he is working on a computer, putting together a new product launch and marketing plan. 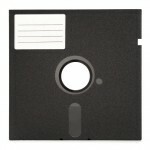 He pulls out a 5.25 inch floppy disk and inserts it into the computer, providing the computer with the necessary program to execute the file he is working on. Wow, that seems so long ago, when computers didn’t have a means of permanently storing programs on a hard drive, no point and click, no color displays! I love predictions about what the future may bring. Maybe that’s why I was always a “Star Trek” fan, because that show was all about predicting what future technology would be like. We are moving so quickly into the future. Mobile devices, and for that matter, all devices we use daily, will have more capabilities than we can imagine. Aaron Goldman, writing for “Search Insider” predicts what our world could look like in his article “2022: A Search Odyssey” as he quotes from Peter Morville’s concept of Ambient Findability. Here is an excerpt from that article. Isn’t it fun to imagine that world, where so many interconnections our brains process now, almost without us thinking about it, will be handled for us. This will leave us free to focus energies on that next step, because, everything is on its way to somewhere.